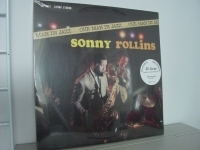 "Sonny Rollins, Our Man In Jazz - LAST COPY"
Classic 45 Speed LP Set "Out of Print, Last Copies, Only 500 Ever Made". As a whole the music on this disc uses a never-ending stream of varying tempos. There is a great deal of group interplay both during the themes and during the improvisations. The tunes, all either well-known standards or familiar Rollins originals, are given very convoluted and unusual readings. Tracks Include: "Oleo" "Dearly Beloved" "Doxy" "You Are My Lucky Star" "I Could Write a Book" "There Will Never Be Another You"